Our weekly trip to the farm shop to get our vegetables yesterday was pleasantly enhanced by the surprise appearance of a mobile meat stall where a farmer was selling his high quality meat directly to the public. He had a great selection of meat including a couple of chickens that looked fantastic. These were not the artificially plumped up specimens you find in supermarkets but quality-looking chickens with all the hallmarks of birds well looked after and raised in a healthy environment. We bought one of those along with some smoked bacon, sausages and, the crème de le crème – two fillet steaks cut off in front of us from a beautiful piece of meat. 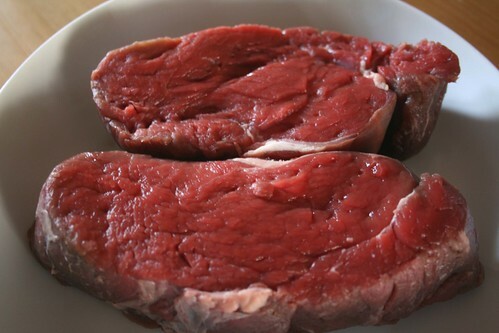 Fillet steak is the very best cut, and this piece had been well hung and had a fabulous deeply dark red colour. Steak this good deserves the very best treatment. For me that’s very simple cooking and serving with complimentary flavours to show off the meat. 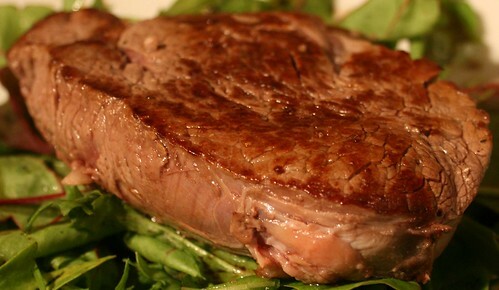 So I served this seasoned and seared over a high heat for just a few minutes, rested then laid on a bed of fabulous salad leaves with a dressing made up of extra virgin olive oil, balsamic vinegar and a little crushed garlic. Simple, good quality, fresh ingredients. Now that’s a satisfying plate of food.